Learn software design by playing games. Use the quiz and the learning game to get familiar with the Design Cards and with arguments and principles of software design. Use a single card set and read the cards before playing. Start with the basic set ( ) and add the other cards once you are familiar with it. We've tried the basic rules for the quiz and the learning game but we have several more ideas and maybe you come up with something else. Feel free to post your ideas and experiences in the comments. Take turns. When it’s your turn, one of the other players draws a card and reads the title to you. If you can correctly explain the card based on the title, you get a point. If your answer is not correct the other players get a chance. In any case read the card aloud. Then it's the next player’s turn—even if this person already got a point by explaning your card. The game ends after 5 rounds (adjust based on the time you want to spend). Sort the cards by color so you have separate stacks of cards. When you draw a card, you can choose which stack to choose from. Cards from the basic set ( ) get one point, cards from the advanced set get two, and extended set cards (once when there will be such) three. If you can name a situation from a past project where the argument on the card was considered or could have been considered, you get an additional point. If you can name even a situation where using the card could have prevented a problem, you get an additional point. Split up into two teams who will play against each other. Remove action and question cards and shuffle the rest. Take turns. When it’s your turn, draw a card, read it quietly and try to explain the card without mentioning the words in the title or synonyms/antonyms thereof. TIP: Read the card carefully and use the examples given. While you explain, your team member(s) have 90 sec. to guess the title. If they manage to do so, your team gets a point. If your team members couldn’t guess correctly, the opposing team gets one single guess to get a point for themselves. In any case read the card aloud. Then it’s the turn of the other team. Every player should get the chance to explain and to guess. So also take turns within the teams. 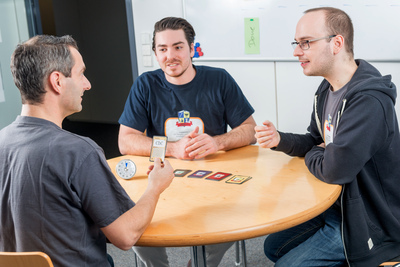 The game ends after each team has read 5 cards (adjust based on the time you want to spend). Don't remove action and question cards. They can also be part of the game. Instead of explaining the card with words, you can draw a picture (think of diagrams or examples). Split each turn into two phases. First the card is explained and the team members just listen. Then the team members discuss among each other and decide on the answer. The first answer they agree on counts.